In the previous post we had a look at a recent proposal N4286 to add stackless coroutines to the C++ language and described the implementation prototype that ships with Visual Studio 2015 CTP. We saw that coroutines can be used to implement lazy sequences. Lazy evaluation is a powerful tool and a pillar of functional programming; it gives the ability to construct potentially infinite data structures, and increases the performance by avoiding needless calculations. Many languages provide constructs to compute a series of elements generating them one at the time, only when they are requested. These are usually named sequences (https://msdn.microsoft.com/en-us/library/dd233209.aspx) in functional languages like Haskell or F#, generators in Python, iterator blocks in C#. Functional languages like Haskell have the concept of list comprehensions, syntactic constructs for creating a list by applying operators to other existing lists. Haskell is perfect to deal with infinite lists, thanks to its laziness, but even non-functional languages like Python and C# provide their version of query comprehensions. In C#, of course, we have LINQ, whose design was heavily influenced by Haskell (Erik Meijer was one of the authors). The LINQ syntax is designed specifically to make it easy to apply a sequence of operations on the sequence monad IEnumerable<T>, in the form of queries. It would be nice to have something similar in an eager language like C++. There are very interesting articles on this topic and I’d heartily suggest reading Bartosz Milewski’s “Getting Lazy with C++” and Eric Niebler’s “Range comprehensions”. Let’s take an example from these two papers: let’s write a small Haskell program that prints the sequence of Pythagorean triples. A Pythagorean triple is a tuple of three positive integers, x, y, and z which satisfy the relation x*x + y*y = z*z. In Haskell this code is very intuitive; we start with (possibly infinite) sequences of integers, and operate on them to generate a sequence of tuples, filtering only the tuples that satisfy the Pythagorean condition. Note that the act of taking only the first elements and the act of printing them are orthogonal to the act of generating the sequence. This declarative query syntax is just syntactic sugar for the invocation of standard query operators (https://msdn.microsoft.com/en-us/library/bb397947.aspx) like Where, Select, GroupBy, Range, …, which are defined as extension methods of the Enumerable class. Can we have something like LINQ in C++? This has been for some time a little holy grail for me; I tried to implement something with Fibers a long time ago but I didn’t really know what I was doing and the result was very kludgy. But now the lazy, resumable generators proposed by N4286 seem perfect for this purpose; when coroutines will be fully supported by the language it could be interesting to think of a new library for query comprehensions that work on these generators. We can use the VS2015 CTP prototype to experiment with this idea. How should a LINQ-like library for C++ look like? How would it work? But even so, the set of operators would not be easy to extend. What we really want is to have the ability to define and add new operators in our code, and have them compose seamlessly. In C# the query operators are implemented as extension methods of the Enumerable class, which makes very easy to “plug” new operators simply by adding new extension methods. In C++ we don’t have extension methods. As alternative, we can follow the lead of Boost Range library that uses the pipe syntax (bitwise OR operator |) to compose the operations. To be honest, at first I had really no idea. But, as Picasso once said, “good artists copy, great artists steal”: so I stole from a real artist. More precisely, I looked at the code of Eric Niebler’s range library, and it was a very interesting read. Here I am reusing some of his ideas, especially to implement a pipeline of operators. The resulting code is much simpler in my case, of course, because I only have to deal with the narrow scope of resumable generators. We clearly need to overload the binary-OR operator | (). When its left argument is a generator, the second argument must be something of “pipeable” to a generator. Therefore, a call to a function like Where() must return “something pipeable”, whatever that means. return operator()(src, pred); // pred ??? But now the problem is: how do we pass the predicate to the pipe? Or, generalizing the question, since operators can have any number of arguments: how do we pass to the pipe all the arguments, if we have an expressions like this? // A forwarding call wrapper generated by std::bind. Let’s look at this in more detail. Type pipeable<> has a template parameter Binder, which is an invokable type, the type of the objects returned when we call std::bind() to bind the call operator (of a type like Where) to a set of arguments. Now, having an object op of class Where, a generator object and a predicate, we can call std::bind(op, sourceGenerator, predicate) and use the result to construct an instance of a pipeable object, so that pipeable::pipe() will call a method already bound to its arguments. The next step is to encapsulate all this logic into a class that acts as a factory for our pipeable types. // an invokable object of an operator class. // Binds _op to its arguments, using a placeholder for the first argument. Class pipeable_factory is templated on a query operator type (a type like class Where above) and it is also an invokable type. Its call operator uses the magic of variadic templates to accept a variable number of arguments and forward them to the std::bind function described before, then uses the result to instantiate and return a pipeable object. Now finally “gen | Where(pred)” works as expected: at the right side there is a factory which binds the predicate to where_op::operator() and constructs a pipeable object. Evaluating the pipe means invoking pipeable<>::pipe(), which calls the bound method replacing a placeholder with the generator object that is at the left side of the pipe. The result is that the pipe expression is evaluated as a call to where_op::operator(gen, pipe). And since the result of this pipe expression can be itself a generator<>, and the bitwise-OR operator | is left-to-right associative, it we have also composability. Operators like Select and Where only take two arguments, a generator and a callable object. But we can have cases a little more challenging. For example the operator Zip, which “joins” two sequences together by applying a specified function to the corresponding i-th element of each sequence and producing a sequence of the results. But this would not compile (with VS2015 CTP) and I am not totally sure if it should. It fails to bind all the arguments to the variadic pipeable_factory::operator() seen before. I suspect that this could work if I could use return type deduction in zip_op::operator() but unfortunately this is not an option, since we need to explicitly return a generator<T> type. What we can do instead is to write operator() as a variadic template function, which can take any number of arguments in its parameter pack. This function can use return type deduction as long as it does not really *implement* a resumable function but only *calls* a resumable function. To generalize the solution, we can put the variadic call operator in a base class generator_operator from which all our query operator should inherit. And each operator class will now lazily do its work in a resumable function exec() that returns a generator<T>. // operator that works on lazy generators. Note that the operator classes are stateless, the exec function can be static and all the state is captured in the closures. The function exec can even be private, since it’s always called through the base generator_operator class, which is a friend of the operator class. declare a pipeable_factory<> for this new type. So far nothing seems to prevent us from making these lazy operators work with any range type, even eager ranges, or with any type that defines begin() and end() methods that return input iterators. However, we are using resumable functions to implement operators for lazy algorithms and we have seen that a resumable generator function can return only a type generator<T> and not auto. Class generator<T> has some other peculiarities that must be taken into account. If we look at its code (in the header file C:\Program Files (x86)\Microsoft Visual Studio 14.0\VC\include\experimental\generator in the VS CTP) we see that class generator is moveable but not copyable. Generators are based on stackless coroutines, which work (as described here) by allocating an activation frame, encapsulated by the class resumable_handler. In this design a resumable_handler provides the functionality to suspend and resume the execution of a function. Every instance of a generator<T> creates and owns a resumable_handler object, and shares a reference to this object with its iterators. This is why the generator<T> type cannot be copyable: we should never have two instances of a generator that refer to the same coroutine. But the type can be moveable, so the move constructor and assignment operator are declared and work by transferring the ownership of the resumable_handler from one object to another. the generator’s destructor is called after the expression is evaluated, well before we can start iterating over the result. So, in the where_op::exec() coroutine we would have a reference to a deleted object. But if we use a move constructor instead, then there is a new generator<T> object that lives in the scope of the exec() function and that takes ownership of the resumable_handle. And since exec() is actually a resumable function, this new generator<T> object is allocated in the coroutine allocation frame and not on the stack. So, this generator<T> object lifespan coincides with the lifespan of the resumable function and everything works. the sources of this small library, with the implementation of a number of LINQ-like operators, like Aggregate, All, Any, Concat, Contains, Count, ElementAt, Empty, Except, First, Last, Max, Min, Range, Repeat, Reverse, Select, Skip, SkipWhile, Sum, Take, TakeWhile, Where, Zip. The code is definitely not production-quality: error and exception handling are mostly absent, the unit tests are minimal. It is just an example of what we will be able to do with lazy generators, when they will become part of C++. In my last posts I talked of a Microsoft proposal to add support for resumable functions and the await keyword to the language and described how this feature had been implemented in one of first previews of VS 2015. Almost a year has passed since then, and there are a few noteworthy updates, so it is time for a new post. In fact, there is a new proposal for resumable functions (N4286) that addresses some of the limitations of the past proposal, and that has been prototyped in the latest CTP of Visual Studio 2015. But let’s start from the beginning. I had been looking for some time now at the problem of implementing coroutines/resumable functions in order to have even in C++ something similar to what is provided by C# await and yield statements. It turns out that – unbeknown to me 🙂 – this is quite a hot topic in the C++ community. The next major version of the standard is expected for 2017 and, in preparation for this, the activity of the standard committee has been organized in 8 groups working on 8 technical specifications, for things like a File System API, a Networking API, Concepts-Lite, Transactional Memory, Parallelism and Concurrency. (See http://isocpp.org/std/status for more details). In particular in the Concurrency TS people are discussing how to improve std::futures to make them more composable, and how to introduce executors (task schedulers) and resumable functions. And while the work on extended futures and executors should only involve updates to the standard library, resumable functions could require changes to the language itself. To be honest, it seems unlikely that these changes will be approved in time for 2017, because there is still no agreement in the committee, but even so, this seems a very interesting topic (well, it is for me, at least…). In the old proposal (N3858) Gustafsson presented the advantages of having language support for resumable functions, proposed the introduction of the await and yield keywords and described two possible implementation, stackful and stackless. The first, based on resumable side stacks (fibers), worked giving to each coroutine its own stack, which was associated to a “real” OS-thread only when the coroutine was actually running. The second, based on heap-allocated activation frames, requires the compiler to do significantly more work, in order to allocate in the heap a data structure to contain arguments and local variables for the coroutine, and to generate the code for a state machine to manage the suspension and resumption points. The Visual Studio 2013 CTP came with a stackful, fiber-based implementation of the await feature, which I described in a previous post. But stackful coroutines have a big disadvantage in the fact that fibers are VERY expensive. By default, a fiber is allocated with the default stack size of a thread, which is 1MB in Windows. Clearly this makes it impossible to have too many coroutines running concurrently; just a few thousand coroutines would eat completely the virtual memory of a 32-bit process. The new proposal (N4286) instead focuses mostly on a stackless implementation, and promises to be scalable to billions of concurrent coroutines. The goal, again, is to be able to have functions that can be suspended, waiting for some asynchronous operation to complete, and then automatically resumed after the operation has completed. For the users, this means being able to explicitly await for an asynchronous completion with await statements, like it’s done in C#. The syntax and the semantic of coroutines remains more or less the same as it was in the old proposal version; the changes are mostly in the way these coroutines should be implemented using activation frames. And since I think that I have already talked more than enough of resumable functions and generators in past, in this post I’d like to focus the attention on the details of this new implementation (which are much better explained in the standard document, anyway). 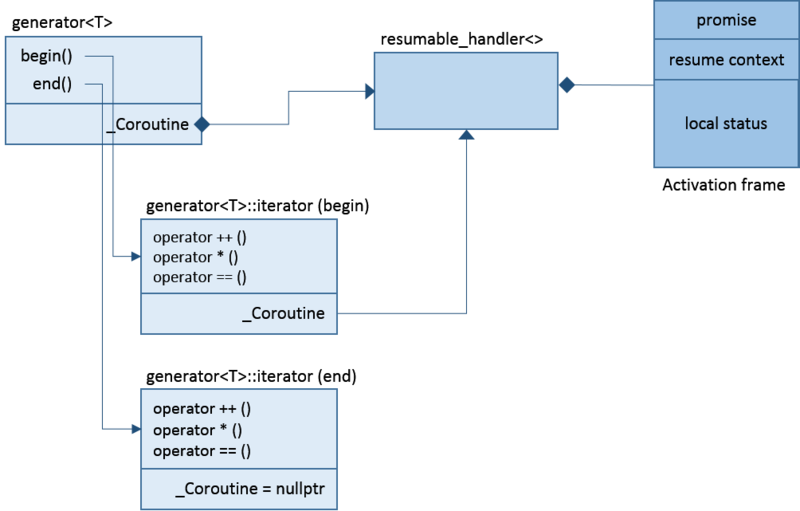 In fact, making a resumable function using a fiber, while expensive, it is not very complicated: after all a fiber is already a system-level implementation of a coroutine. But making resumable functions with just an activation frame requires much more work for the compiler, which needs to alter the structure of the code, turning it into a sequence of chained continuations. To have a look at how stackless coroutines of N4286 are supposed to work we can play with a first prototype which is already available in the CTP version of Visual Studio 2015, freely available for download here. The only meaningful difference between this prototype and the standard proposal is that in the prototype we’ll have to deal with PPL tasks rather than std::futures. This is because N4286 is based on an improvement of standard std::futures, extended to support the chaining of continuations with std::future::then() like it’s done in boost::future. But, as we know, schedulers and continuation chaining are not yet part of the standard; therefore the VS prototype replaces futures with PPL tasks and utilizes the Concurrency runtime for their scheduling. But this is just an implementation detail: the term “task” in what follows should be read just as an alias for the “std::future” of the future. __await delay(2000); // suspension point (suspends testAwait, resumes delay). In order to compile this code with the VS2015 CTP we need first to enable a compiler extension by passing the /await flag to the compiler options for our project. To use this new feature we also need to include the header file <pplawait.h>. If we run this with the debugger we can see that the execution really suspends at the __await point and the control goes back to the caller of our testAwait function, which can then go on doing other stuff. After two seconds the delay task completes and the execution of testAwait resumes from where it had suspended. Normally it will resume on a different thread, one of the worker threads used by the PPL scheduler. There are other limitations in the current CTP implementation: only the x64 platform is supported, not Win32, and stack-frame run time checks (/RTC) need to be disabled because not yet compatible with /await. But these are just minor issues; after all this is just a prototype and not supposed to be used for production code. But how does all this work? In a previous post. I investigated some of the details of the stackful prototype who came last year with VS2013 CTP. Let’s do the same with this new implementation in the latest CTP. Most of the library logic for this feature ships in two header files (resumable and generator) located in the \Microsoft Visual Studio 14.0\VC\include\experimental\ folder. As we said, in a stackless implementation a coroutine is associated with an activation frame that is allocated somewhere in the heap and that contains the status of the coroutine together with all the data required to manage its suspension and resumption. In N4286 the frame is an instance of the compiler-generated class coroutine_handle. In the VS2015 CTP an activation frame is encapsulated by an instance of the resumable_handle type. (This was the old name of a coroutine_handles in a previous version of the standard document). A resumable handle owns the block of heap memory that represents the activation frame for a function. In general, data in a frame is organized like in figure: there is first the space for a special coroutine promise type, followed by the space for the “suspend context” and the local state (parameters and local variables). We’ll see later how the C++ compiler makes use of these functions in the code that it generates for a suspension/resumption point. In the VS2015 CTP, the logic of a promise for await statements is in class resumable_traits<RetType, …Args>::promise_type. This traits class (renamed as coroutine_traits<> in the latest version of the proposal) is templated on the return and argument types of the resumable function and aggregates all the type-dependent types and methods, like the activation frame allocator. // Returns true is the results of the asynchronous operation is already available. // Suspends the execution until the asynchronous operation completes. // Resumes the execution from where it had suspended. From this, it should be clear that the mechanism is easily extensible to new types. We can await on any type for which we can provide the three await functions. // Allocates coroutine activation frame. // Creates a task to be returned to the caller. // This task is associated to the task completion handle of the promise. // when the task ‘taskToAwait’ completes. Let’s look at this in detail. First, a single resumable handler for the whole function is allocated. This is an instance of a template class, specialized on the types of all the function parameters and on the return type. The frame size is calculated at compile time to also hold the local variables declared in the function. One of the arguments to _Alloc() is resumeAddress, a pointer to the callback function that will be called when the asynchronous operation completes. Any resumable function must return a task, so the next step is to prepare the promise and the task that will be returned to the caller. After this preamble, the code of the function executes normally, in a synchronous way, until it gets to an await (or yield) statement. In our case we want to await on the task returned by a call to delay(timeInMs) and, as we saw, there is library support for awaiting on tasks. The compiler adds a call to await_ready to check if the task has already completed. If this is the case, we can skip the asynchronous part and just get the task result. But if the task has not yet completed we need to suspend the execution. This is done by returning our return-value task to the caller, so that the caller is able to carry on doing other work or maybe also awaiting asynchronously on our task to complete. So, now the method testAwait has suspended and returned a task to the caller. The caller is free to do other things or it can also suspended waiting for the task we returned to complete. Meanwhile, life goes on, the scheduler keeps scheduling, time goes by and at some point also the two seconds of the delay task elapse and a call to our continuation can be scheduled to run. in order to jump to the Resume: label and complete the await operation, retrieving the result of the completed task and returning it to the caller as a result of the returned task. The other asynchronous constructs made possible by coroutines are lazy generators: functions that produce a (possibly infinite) sequence of values that can be pulled one at the time. These are the equivalent of C# iterator blocks or Python generators; the function suspends after having “yielded” each value, and resumes execution when the next value is requested, until the sequence completes. Going back to the usual example, this is a generator for the Fibonacci sequence, written with the syntax of VS2015 (where the keyword __yield_value is used in placed of yield). In the VS2015, the code for generators can be found in the file \Microsoft Visual Studio 14.0\VC\include\experimental\generator. I could dig into this code and try to describe all the details, but I would risk to become repetitive and sound like a broken record. In fact, the implementation of the prototype for generators turns out to be very similar to the idea I sketched in one of my last posts. (This, of course, not because my idea was particularly brilliant but only because there are not many other ways to write generators using coroutines :-)). _coro(); // starts the coroutine and executes it until it terminates or yields. We see that in order to compile a function like Fibonacci above, the compiler must allocate a resumable_handle and use it to construct an object of type generator<T>. The role of the generator class is just to provide the semantics of range, with input iterators returned by begin() and end(); all the logic for the lazy generation is in the iterator class. An iterator owns the resumable_handle which was passed to the generator, and uses it to resume and suspend its execution. Even here, a resumable handle works as a wrapper for the status of a coroutine. There are just small differences respect to await: here a different type of promise it’s used (of class generator::promise_type), designed to support yield_value and to store the last value yielded so that it can later be pulled by dereferencing the iterator. The result is quite neat, in my opinion: C#-like generators will be very useful, especially if they could be composable with LINQ-like operators. But again, for more details, I’d refer to this post, or (even better) to the standard document. Resumable functions can be used to add support for await and yield in C++. They can be implemented with stackless coroutines in order to be more scalable (at the price of greater complexity in the compiler). Stackless coroutines work allocating a single activation frame for each invocation of a resumable function. The implementation requires the support of improved std::future (composable with then()), which are also being standardized. Hopefully, something like that will be part of the standard soon. (Note: slightly edited on 2015/3/8 to clarify a few points).